At tonight’s event held at 21c Bentonville, Rena Detrixhe took home a $5,000 grant to install a 1,000-square foot ephemeral, site-specific project at Western Michigan University in Grand Rapids, Michigan this fall. BENTONVILLE (Arkansas) MAY 22, 2017 -- ArtPrize, the independently organized art competition recognized as the world’s largest annual public art event -- in collaboration with 21c Museum Hotel, Delta Air Lines and Experience Grand Rapids -- tonight awarded a $5,000 grant to Rena Detrixhe for her Pitch Night Bentonville-winning entry, “Red Dirt Rug”. In addition to the grant, the installation earned a guaranteed spot at Western Michigan University Grand Rapids during ArtPrize Nine, slated to take place September 21-October 8, 2017. “A dimension of Rena’s work that we all enjoyed was the idea of picking up a patch of land in one place, in a very sensitive way, and moving it to an entirely different place on the earth,” said Dayton Castleman, Museum Manager at 21c Bentonville. Tonight’s event was hosted by 21c Museum Hotel at their Bentonville, Arkansas location -- on the northeast corner of the Bentonville town square and a short walk to Crystal Bridges Museum of American Art. 21c Bentonville features more than 12,000 square-feet of exhibition space seamlessly integrated into all areas of the property, with opportunities to discover art around every corner. Rena Detrixhe’s work was selected from among five artists that were invited to present at tonight’s Pitch Night event. Each artist was given five minutes and five slides to sell their ambitious, site-specific installation idea to a panel of local arts professionals including: Dayton Castleman, Museum Manager at 21c Bentonville; Don Desmett, Curator of the Western Michigan University ArtPrize venue; Shannon Dillard Mitchell, Independent Curator; Lauren Haynes, Curator of Contemporary Art at Crystal Bridges Museum of American Art; and Marc Mitchell, Curator and Director of Exhibitions, Co-Director of Graduate Studies, and Assistant Professor at the University of Arkansas. Over the past year and a half, Detrixhe has explored the landscape of Oklahoma -- its history and its geography. Like many others, it is a place where human presence has deeply altered the landscape. As the daughter of a soil conservationist and a ceramicist, Detrixhe was drawn to the rich red dirt -- the dirt of the Dust Bowl -- that is emblematic of this part of the country. Her Pitch Night-winning project is a monumental, ephemeral, site-specific carpet made out of this red dirt. 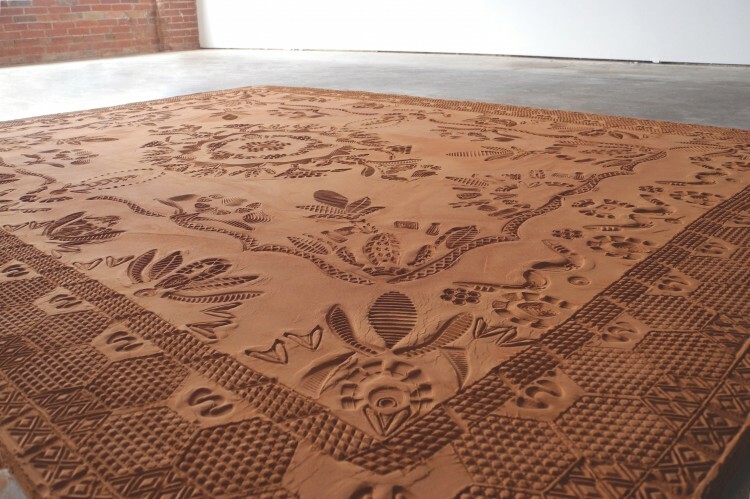 The artist will collect more than 240 gallons of red soil, refining it all by hand before creating the installation. She will spread the dust in a thin, even layer on the floor at Western Michigan University Grand Rapids -- creating a 1,000-square foot canvas on which to apply a pattern with modified shoe soles one shape at a time, until the form of the rug is revealed on the surface. The shoe prints act as an indicator of human presence, of culture and pattern, and also represent a literal separator between people and the earth. ArtPrize Pitch Night launched in 2013 as a means of discovering and supporting ambitious, exciting projects and to reduce the barriers to bringing them to the annual competition. Since its inception, the Pitch Night program has continued to expand and in 2016 includes events in six cities across the country. 21c Museum Hotel will host three events -- in Louisville, KY on May 15; in Durham, NC on May 17; and tonight in Bentonville, AR. The Museum of Contemporary Art Detroit will host a Pitch Night event on June 1, the Contemporary Arts Center, New Orleans on June 5, and the Indianapolis Museum of Art on June 8. Each event will award the winning artist $5,000 and a spot in a prominent ArtPrize venue during the eighth annual event.